This next gen anti-malware gives you intelligent triple layer protection. One, it recognizes trusted sites and applications. 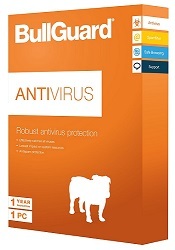 BullGuard Antivirus it’s gaming friendly so you can game at lightning fast speeds without being forced to disable your protection. When others around you are panicking you'll be cool because you know you’re fully protected! Vulnerability Scanner keeps you safe by blocking access points hackers like to exploit. It automatically alerts you to missing security updates, or connections to insecure Wi-Fi networks. It also prevents applications that could contain malware from downloading automatically and checks applications and drivers have valid digital signatures. Additionally, it cross references your network protocol against your ISP’s profile and runs checks on network encryption. Sounds complicated? That’s because it is, but don’t worry - they've got your back.